Everyone is moving towards fall, and we want soups and stews and all the pumpkin things. But if you happen to live in South Florida, or Texas, or any other place where fall is basically non-existent then you are probably still dealing with 100+ degree temps and soups are definitely NOT what you have in mind yet. And these aren't just any old regular zucchini noodles. No, no, no. 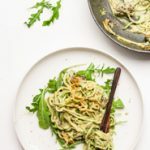 This zucchini noodle dish is covered in a delicious oil free arugula Alfredo sauce that is oil free, and bursting with flavor. Out of alllll the zoodle dishes I have ever tried, homemade and restaurant-style, this zoodle dish with creamy arugula alfredo sauce is definitely THE BEST. Zoodles have always been in my 'meh' list of things I don't really care too much for. I'll be honest. Zoodles are not like my favorite dish ever or anything like that - no way. But zoodles are healthy.. and it's a good way to use up some zucchinis (if you grow your own), or simply want to get some of the health benefits of zucchinis into your system (which includes improved gut health, improved eye health, and a boost of energy!). Also, zoodles are a nice way to pretend you are having pasta... without any of the bloating, or guilt, that may come after ingesting an entire dish of wheat pasta. Zucchini noodles are also very easy and quick to make. You can even save some time by serving them 'raw' and completely skipping the cooking part. There are actually THREE different ways you can enjoy this dish, and I break down each part in detail in the recipe card, but I'll give you a quick run down here. Basically, salt plays a major role in whether or not you will end up with a successful zucchini pasta dish. See the thing, is that salt, pulls water out of the zucchinis.. so if you add too much salt and not at the right time, you'll end up with super wet and mushy zoodles, which nobody likes. The arugula Alfredo sauce should be thick and creamy because this will help absorb some of that excess water that zucchinis naturally release. Option A: Leave them raw and crunchy. Tip: don't add salt and serve them right away. Option B: Leave them raw, but soft with a 'cooked' feel to them. Tip: throw a pinch of salt, let sit for 5 minutes to drain excess water, pat them dry and then add sauce and serve immediately. Option C: Cooking them entirely. Tip: Don't add salt, cook for 5 minutes on low/medium heat before adding sauce.. once zoodles are soft, then go ahead and add the sauce. Whatever way you decide to enjoy this dish, it'll be delicious either way and a great way to skip real heavy pasta for the night and enjoy something heartier and lighter. Luckily now a days it is easy to find pre-cut zucchinis/zoodles in most natural food stores like Whole Foods. But, if you are more of a DIY-er then you can definitely get your hands on a cheap spiralizer like this one from Amazon (for under $30) and make your own zoodles all day every day. Ps. you can make more than just spiralized zoodles with this machine. You can make butternut squash noodles, and curly fries! I've had this machine for over 2 years now, use it pretty often, and still works like a charm. Ps. That crumbled parmesan looking cheese on top of the zoodles is a delicious vegan cheeze recipe that I will be sharing next week.. so make sure to come back here to look for that, or you can just subscribe to receive our bi-weekly emails straight to your inbox with our recipes included. 😉 Enjoy! optional spices for the mushroom saute: a dash of each – garlic powder, onion powder, cayenne pepper, black pepper, and salt. 1 loose cup of arugula (20g) (and a bit extra to serve the pasta on top of it as pictured). Begin by sauteing mushrooms and chopped red onions in a saucepan over medium heat. Drizzle a little bit of veg broth to replace oil. Add optional seasonings – my favorites are garlic powder, onion powder, cayenne pepper, black pepper, and salt. You only need a little dash of each so I didn’t include measurements. Continue to cook until mushrooms and onions are soft and tender. Set aside. Make the arugula Alfredo sauce. 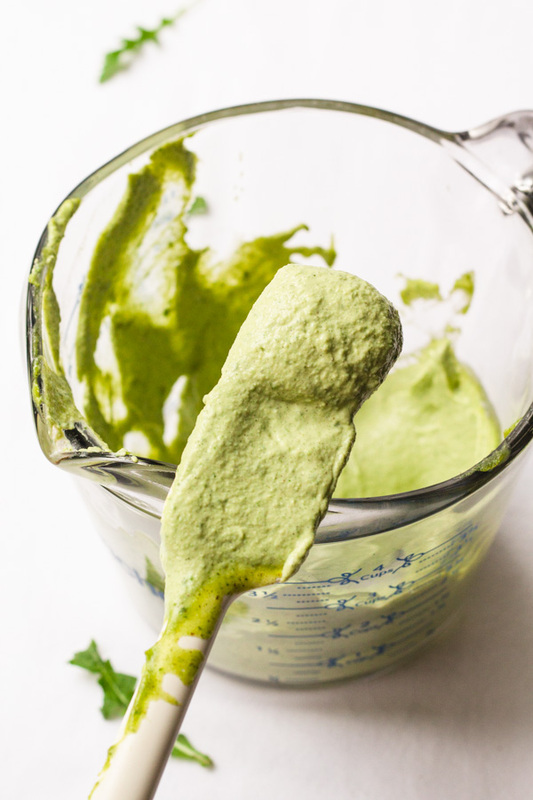 Combine all ingredients listed under ‘sauce’ in a blender until creamy and smooth. I use a vitamix and don’t need to soak my cashews – but if your blender is not very powerful it is recommended you soak the cashews for at least 30 minutes in hot water for ultimate creaminess. Prepare the zoodles. If you are using pre-cut store bought zoodles then you can skip to the next step. If you need to cut your zoodles using a spiralizer, go ahead and do that now. (I use this cheap spiralizer from amazon and it has lasted for years now and always works like a charm.) Place cut zucchini noodles in a mixing bowl and set aside. If you want to keep the zoodles ‘raw’, then continue reading for options, if you want to cook your zoodles then proceed to step 5: Option A: If you want to keep the zoodles raw and crunchy, then that’s it, you are basically done. Add your arugula alfredo to the mixing bowl with the noodles (also add the mushroom saute if using), and gently combine and serve. Zoodles will be raw and crunchy. 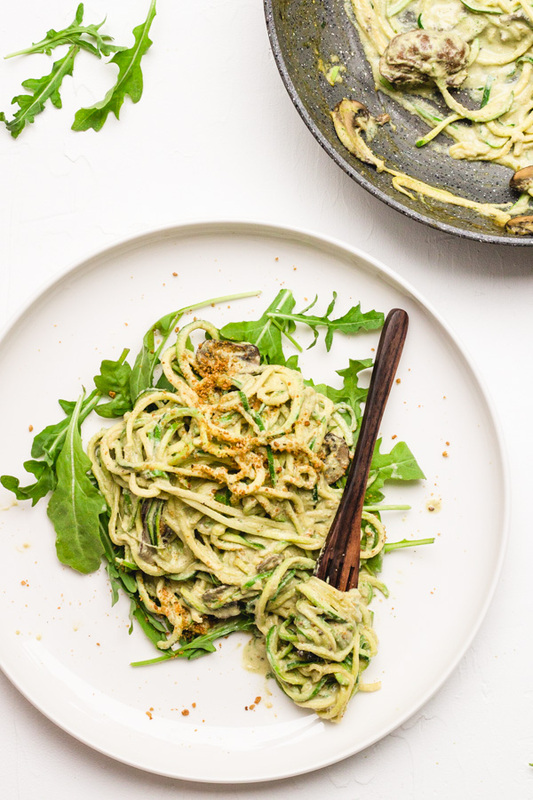 Option B: If you want to keep the zoodles raw, but want them to be soft and feel as if they are cooked, then before mixing in the arugula Alfredo, add a pinch of salt to the zoodle mixing bowl and let the zoodles sit for about 5 minutes to allow the excess water to drain from them. Zoodles will be super soft and wet. Drain and dry with a paper towel the excess water, add the alfredo sauce and mushroom mix, and gently combine and serve immediately. If you want to cook the zoodles: After cutting the zoodles using the spiralizer, add the zoodles to the saucepan with the mushroom/onion mix and cook over low/medium heat for about 5, and then add the arugula alfredo sauce to the saucepan and gently combine to mix everything in. The arugula alfredo sauce should be very thick, and that will help absorb some of that extra water the zoodles may release while cooking. Once zoodles are nice and soft, serve and enjoy! You can serve the pasta on a bed of arugula and some avocado sliced up on the side. In summary – if you want to cook your zoodles I suggest you do NOT add salt to the zoodles because this will result in a super wet mess. The salt pulls water out from the zucchini. The sauce should have enough flavor.. but if you feel that the dish needs more salt, add it in the end once everything is served and you are ready to eat. If you want to keep it raw – there are two ways – soft vs crunchy. If you want the zoodles to stay crunchy, do NOT add salt because the salt will make the zoodles ‘wilt’ and make them soft. The mushroom/onion mix is totally optional and completely flexible. You can get creative and add red bell peppers, minced garlic, broccoli, and any other veggies you can think of. Yes! This looks awesome. Arugula is my fave! I so need to try zucchini noodles! I can’t believe I haven’t done so yet… Thank you for the inspiration. It looks delicious! Hey Kate! Thanks for stopping by. Yessss you have to give zoodles a try. It’s definitely *not* pasta haha buttt it’s still a delicious meal in it’s own way. I recommend you give it a try with a tasty sauce like this arugula alfredo – it makes zoodles taste even better! !